Armistice weekend was a busy one for us. Many guests wanted to stay with us but all our rooms were full months go, so over the weekend we had a steady succession of lovely guests who popped in for a cuppa and a chat even though they had to stay elsewhere. 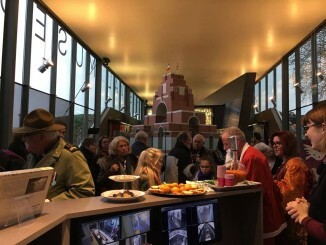 The kettle was always on and it was wonderful to see so many people who had come out to commemorate the Armistice centenary. We loved seeing you all so thank you for popping in – you know who you are! Sunday 11th started as wet but not a cold day. After fortifying everyone with breakfast we joined our mayor Christian Bernard to commemorate at the village memorials in both Ovillers and La Boisselle as well as Ovillers Military Cemetery. We were on strict instructions by Richard Dunning MBE to get Christian to the Lochnagar Crater for 10.45 at the latest for the 11.00 silence. At 10.45 we were still at La Boisselle war memorial. But somehow we made it to The Crater at 10.56 and all was well. Stressful but on time – just! 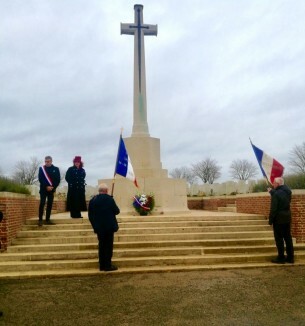 At Ovillers and La Boisselle our friends and guests Colleen, Paul Livings and Clive Downer laid wreaths and Sally and Chris Burge laid a Welsh slate which Sally had painted with a poppy and a Tommy. All the villagers remark on it at the village memorial. At Lochnagar a special, unique service was held. After the last post and silence at 11.00, Richard, invited the congregation to come forward and collect a white lily to put on the Cross, with the hope that we could cover the cross in white lilies as a symbol of peace. While this happened, Julie read out names of soldiers who had been killed during the conflict. One of 4 voices, Julie read the British, Christian Bernard, French names, Marcus the German names and Stephen other nations. The village children took part and sang Le Marseillaise. It was very emotional reading the names on such an historic day. Names randomly chosen to represent all those who fell. The Cross looked magnificent covered in lilies and they remain there still. The story was picked up by the UK’s Daily Mirror and Julie was quoted in the paper. After a Vin d’honneur in the village hall we continued a day of commemorations in or village at the 34th and 19th Division Memorials and The Tyneside seat. At 3pm we held a small informal service in Mametz Wood and afterwards we ended the day’s commemorations at Fricourt German Cemetery where our friend and guest Karsten laid a wreath remembering all Danes who died during the conflict. The day was exhausting and exhilarating in equal measure. But it is the small, simple things that we like at No.fifty6 and the next evening we felt we wanted to commemorate the Armistice in a simple way ourselves. 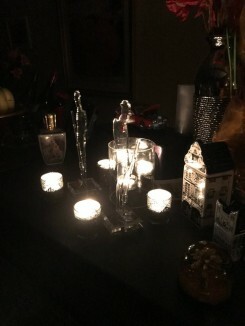 We lit candles by our "There But Not There" Tommy statue in the new dining room and quietly reflected, as those with us silently reflected too until the candles burned out. It was a special moment. Thank you Sally, Chris, and Colleen for sharing this special Armistice moment with us. We continue to have wonderful guests bringing their stories. Glenn Reddiex visited from New Zealand, on a pilgrimage across the battlefields following the stories of New Zealand soldiers. Glenn collects WW1 postcards. After he came across a postcard of a great-great uncle while researching his family history, it sparked his interest in piecing together history through postcards. Glenn has written a book called “Just to let you know I'm still alive”, which contains postcards from his collection and the stories behind them. The title is a nod to a line many soldiers used when writing to their loved ones. Sadly, the Great great uncle who inspired his work – George Fox - died in 1917 and is commemorated on the Messines Memorial, George died knowing that his younger brother Thomas died on The Somme in September 1916. Thomas Fox is buried in Gommecourt. 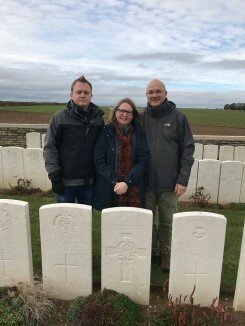 Jude and Dave Farrimond-Sheddon made their first visit to The Somme in 2014 and they were keen to return to commemorate the Centenary of the death of Jude’s grandmother Harriet’s first husband Thomas Smith who died on 1st November 1918 and is buried in Rocquigny-Etrancourt Cemetery. Jude and Dave came with their son Ben and spent the day with David following in Thomas’s footsteps. They also followed in the footsteps of Jude’s Great Uncle Arthur Farrimond who served with the 9th Royal Scots. 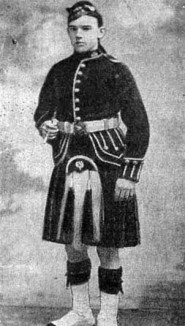 He survived the war but in France was wounded in the knee and stomach from a bayonet charge. 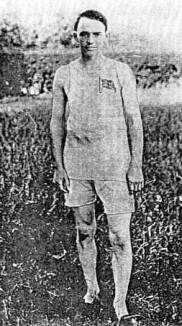 After the war, recovered from his injuries, he went on to run the marathon in the 1924 Paris Olympics. Quite a story! Wendy and Danny have visited The Somme for many years, drawn by its unique poignancy. Danny and Wendy both have relatives who fought here, and they came to see the plaques which are now installed at Lochnagar for their relatives Frederick Dowton and Hickson. Brian and Pauline Hall visited with their friends Stephen and Elaine from Staffordshire. It was a visit Brian had wanted to make for a while, having researched his Great Uncle who served and died. Thomas Truby served with the 15thBattalion (Bantams) Sherwood Foresters and was killed 15thJuly 1916 at Trones Wood and has no known grave so is commemorated on The Thiepval Memorial. 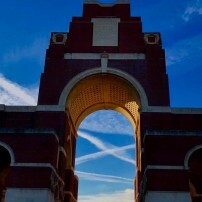 Brian had studied books, diaries, Google maps etc, before he came, but nothing had prepared him for seeing the landscape, the area where Thomas was killed and The Thiepval Memorial. He was humbled by the experience. Gordon Haymes visited from Kent, a frequent visitor, with his work friend Nick who was visiting for the first time. Gordon took some wonderful photos while he was with us. Misty November days creating a special atmosphere on The Somme and visiting Hangard where Gordon’s relative was killed. Heather and Malcolm Johnson visit every year. 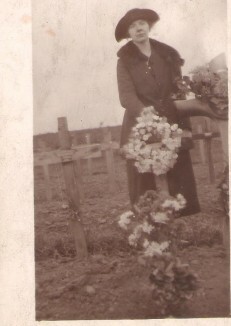 Heather has a Great Uncle on Thiepval – a 3rd Battalion Coldstream Guard who was killed at Ginchy in September 1916. Heather and Malcolm stood on the track at Ginchy near to where he fell on a damp November day. Drawn to this place. Each pilgrimage is special and all the stories of these men leave an imprint on our hearts, binding us closer still to this special place we call home. 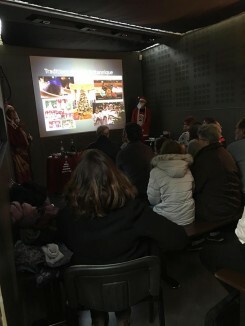 On Sunday 25th November we were invited by Thiepval Visitors’ Centre to host a talk on British Christmas traditions in French for a French audience (though open to all). We were delighted to oblige and we spent a lovely afternoon in the Centre talking about Christmas – from pagan traditions to Queen Victoria and the Queen’s speech. We introduced the audience to crackers (no crackers in France), Boxing Day (no such day) and Christmas pudding rituals etc. 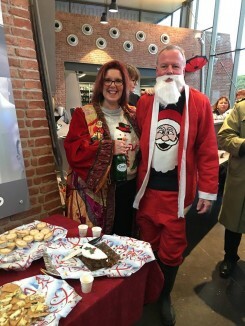 After singing Christmas carols we then adjourned to the welcome desk where we shared Christmas foods - mince pies, Christmas cake, pigs in blankets (try translating that into French) and Stilton with biscuits. All washed down with a non-alcoholic Christmas punch or a glass of sherry – again a tipple not known in France. We loved doing it and the audience were so warm and appreciative. David even dressed as Pere Noel. The event was reported on in the Courier Picard and apparently David and Julie have “delicious” British accents! It has kicked off the Christmas festivities for us! 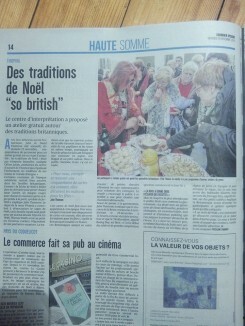 Talking of Christmas, this is our last newsletter before Noel so Joyeuses Fetes to all of you. May it be healthy and happy and may Santa leave you something you cherish in your stocking. The hens are early to bed now with the nights drawing in – but we are still getting 5/6 lovely eggs per day. By 5.30pm they are tucked up with their winter blankets and have had their bedtime story read. At the same time the rabbits get their bedtime treat of a carrot and cabbage leaf. Life is sweet at No.fifty6. From the "Notts and Derby Boys"
Another great news letter from my favorite place on the Somme. Coming late to this but we really enjoyed your newsletter, you two are inspirational in all you do as are your guests with their personal family stories, research & photography. Thank you for sharing our family stories from The Somme...we were pleased to be there to honour Thomas on the centenary of his death. We hope to find more information about Thomas & Harriet & Arthur too in order to help us understand their lives pre, during & for Harriet & Arthur, post war better than we do. Wishing you a peaceful Christmas & a happy & healthy new year. ps Gordon & Joana I think it may be shadow on Arthur's knee but yes he was indeed a fasinating man but like so many others he never spoke of his war time experiences but I think his decision in 1915, published in letter to a local paper describing conditions in the trenches & his decision to run in 1916 Olympics (he obviously had to wait a lot longer than that!) kept him going! It is another wonderful newsletter I can never wait to read it to see where your visiters have been and their interesting stories of why they come to stay. And your own story of what you have both been upto. And for the 100th you have been very busy. And I totally agree with Malcom and Heather there is no better place then around your table at No. 56 to finish your day. To you both have a Wonderful Christmas and all the very best for 2019. Another great news letter, Hope to visit again soon. Another great newsletter and what a busy time you've had with all the Armistice commemorations. Hope you both have a wonderful Christmas and New Year and look forward to seeing you in July. Really interesting. Thank you. So looking forward to our first visit next July. Thank you once again for an outstanding newsletter. We were delighted to see the incredible work of the Johnson’s, in particular Heathers website which brought to attention Mme Guerin...THE POPPY LADY. Facts that many many people are unaware of. Thanks Julie and David for another very Interesting newsletter! La fraicheur de l'aurore, de lueurs du ponant. I think this is beautiful,don't you! Mops up tears and makes lunch. You have had a busy month, haven't you. 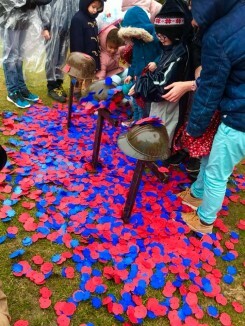 Did you manage to see any of Rob Heards Shrouds of the Somme at Theipval. Steve and I went down to Queen Elizabeth Park to see the whole display , all 72,396 of them. So moving. Love reading your monthly news, and live in hope that I'll get the chance to come back and see you both again. Another great newsletter and a very busy commemoration period. Hope you both have a great Christmas and New Year. Look forward to seeing you again next February. As always, it is great to hear the poignant stories belonging to your other guests. There is nowhere better than around a table at No. 56, to share them! Thanks for giving Poppy Lady Madame Guérin a mention. I fear that I will never be able to pronounce her name as well as you, Julie ... yes, David, I will strive to continue with the book about her but I doubt if I can make your deadline! All seasonal greetings sent to you both - health and happiness for 2019. Thanks for your hospitality recently, it is second to none. Do I believe Marcel, or the chickens? Mmm.